After nearly a year of hunting for a grille I found one second hand on ebay! Fitted it tonight, looks good. Connected mazdaEdit to the ecu. More slow progress because of the crap weather. Oil cooler is mounted, air filter on and bumper test fitted. Everything fits! Got immobiliser problems, fast flashing immobiliser light, no starter. Anybody know where the starter interlock switch is? I'm pretty certain I don't remember coming across this. Going to earth the pin on the starter relay and bypass the pcm to start with. Starter interlock switch is the switch on the clutch pedal..not fitted on uk series 1 rx8 cars i believe on usdm and jdm cars my S type had to have the clutch pedal down to start. 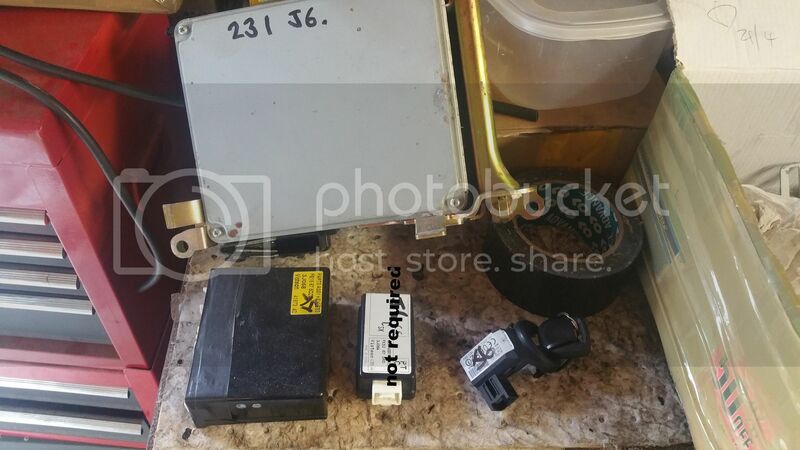 Id check all the fuses first..flashing immobiliser light usualy means not recognised key chip. You probably know this but never put jump back on with ignition ON has been know to wipe immobiliser codes and/or fry pcm..
Id check your fuses and report back. The immobilisation is the starter relay and 2 other circuits so its gonna be the flashy light stopping it energising. The fact you now cant get comms with mazda edit makes me think a missing feed from a blown fuse or such like. What do you mean by the other 2 circuits? Coils and fuel pump circuit are also disabled by the pcm for immobiliser function. Fuel pump was priming. That's what I can't get my head round. What parts are "coded" pcm obviously, keyless module.. What else? Trying to find a photo and failed. You need pcm, key and visteon immobiliser module all from same car. The coil and receiver are dumb and not needed to be coded. As all your bits came from a running car must be a power feed or missing earth. Not sure why your cars priming the fuel pump though. the receiver is required but not coded. got some doubt in my mind of the coil...but all your parts are from the same running car? if you get stuck this is my spare running set so could send it out to you.